From the Hancock County Courthouse, go east on Broad St. for two blocks and turn right on Boland St. Follow Boland which becomes Linton Rd and go for 2.7 miles to Brown Chapel Rd. on the left. Turn left on Brown Chapel Rd. and go 2.9 miles. The cemetery is behind the church on the left. Persons numbered 300 and higher have been added since the original cemetery survey. They are buried somewhere within the cemetery. Brother & Son. Your Loving Family. DEX (on footstone). Writing on marker is illegible. Gone But Not Forgotten. Champ. Father. God is my Refuge and Strength. Bo. Last name spelled "Reyhalds" -- Reynalds assumed. Handwritten on slab. Age 54. Ingram Brothers Funeral Home tag on slab. Tag nearly impossible to read. Birth year is written 19--. Birth year apparently unknown. Death day may be Apr 18. "Hines" mortuary on gravestone. Grave located behind church door. On opposite end of slab to Mrs. Fannie Reese. "Hines" mortuary on gravestone. On opposite end of slab to Lottie Will Thomas. Grave is near church and surrounded by by rocks. Grave is surrounded by rocks. First name could be Mittie or Millie. At Rest. Age 54 years. February may be the birth month. Information is very difficult to read. Wife and Mother. Now cometh eternal rest. Slab is unmarked. Information taken from funeral home marker. w/o B.H. Harris. In love she lived/ In peace she died Her life was craved/ But God denied. d/o Anna Pearson. Gone in her young years ere sorrow could... Marker is broken and lying on ground. s/o Willie and Lois McLin. We love you. Information taken from funeral home marker where age at death was listed as 79. Birth year was not legible. Information taken from funeral home marker where age at death was listed as 52. Eight unmarked graves surrounded by rocks. One has rusted funeral home tag with dates 1925-Dec 6, 1927. He has gone to the Mansions of Rest. No dates. Age 8. No dates. Looks like "ABROR" on grave but name was probably "Abron". 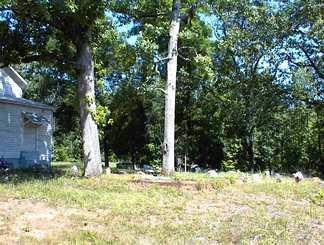 Large open area with possibly several unmarked graves. First name spelled as shown. No day in death date. Broken crockery bowl and pitcher on grave. Two to four unmarked graves. Age 54. Information taken from funeral home tag where age at death was listed as 54. Unmarked grave enclosed by rusty fencing. Our beloved mother. Rest in Peace. Information taken from funeral home tag where age at death was listed as 73. Angel at foot of grave. Possibly three to four graves. Alpha Aug 29 1945/Omega Jan 12 1999. In Loving Memory. "Bill" on stone at foot of grave. Age 63. All info from obituary.